The rendering in A. V. of (Lev. xxi. 20, literally "thin"), denoting one of the physical disqualifications of priests for the service. In this sense is taken by Targ. Yer. ( ) and Ibn Ezra ad loc. (comp. Bek. vii. 6), but the adopted rabbinical tradition (see Sifra, Emor, 3; Bek. 45) and modern commentators explain the word differently (see commentaries ad loc. ); nevertheless, the dwarf is declared unfit for service (Ḥullin 63a; Sifra, l.c. ; Bek. l.c. ; see Blemish). Legends concerning giants and dwarfs exist among all nations (Tylor, "Primitive Culture," i., ch. x.; German ed., i. 379 et seq. ; comp. Wutke, "Der Deutsche Volksaberglaube der Gegenwart," p. 42; Lehmann, "Aberglaube und Zauberei," p. 67, Stuttgart, 1898; Seifert, "Zwerge und Riesen," in "Neue Jahrbücher für das Klassische Alterthum," etc., vol. v., part 2, p. 9). These legends are based mostly on primitive conceptions regarding the original inhabitants of a country. In the Bible the pre-Israelitic inhabitants of the Holy Land are supposed to have been gigantic—a reminiscence of the prehistoric man (comp. 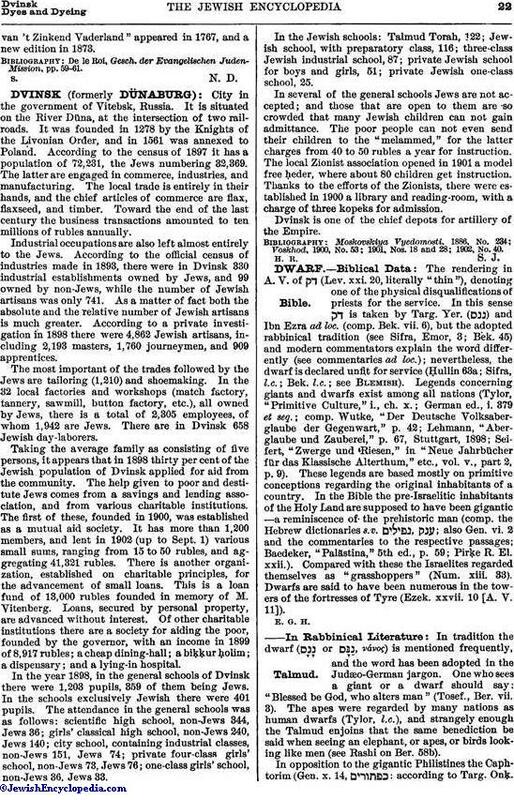 the Hebrew dictionaries s.v. ; also Gen. vi. 2 and the commentaries to the respective passages; Baedeker, "Palästina," 5th ed., p. 59; Pirḳe R. El. xxii.). Compared with these the Israelites regarded themselves as "grasshoppers" (Num. xiii. 33). Dwarfs are said to have been numerous in the towers of the fortresses of Tyre (Ezek. xxvii. 10 [A. V. 11]). In tradition the dwarf ( or , νάνος) is mentioned frequently, and the word has been adopted in the Judæo-German jargon. One who sees a giant or a dwarf should say: "Blessed be God, who alters man" (Tosef., Ber. vii. 3). The apes were regarded by many nations as human dwarfs (Tylor, l.c. ), and strangely enough the Talmud enjoins that the same benediction be said when seeing an elephant, or apes, or birds looking like men (see Rashi on Ber. 58b). In opposition to the gigantic Philistines the Caphtorim (Gen. x. 14, : according to Targ. Onk. "Cappadocians," according to modern commentators "Cretes") are called dwarfs (Gen. R. xxxvii. 5). There is here, no doubt, the general legend in regard to dwarfish tribes and nations. Legendary elements may perhaps also be found in the following parable: The governor of a province summoned for the king the men having the necessary military stature. A woman complained that her son, who was a dwarf, but whom she called "swift-footed giant" (μακροέλαφος), had been overlooked. She was answered: "Though he be in your eyes a makroelaphos, in our eyes he is a dwarf of the dwarfs" (Gen. R. lxv. 11; Cant. R. ii. 15). Nebuchadnezzar is frequently called in rabbinical literature "the dwarf of Babel" (Pesiḳ. xiii. 112a; Pesiḳ. R. xxxi. ), or "the little one ell dwarf" (with reference to Dan. iv. 14, 17), "the lowest of men" (Yalḳ. ii. 1062); according to another tradition, Pharaoh was the dwarf referred to in Daniel, l.c. (M. Ḳ. 18a). 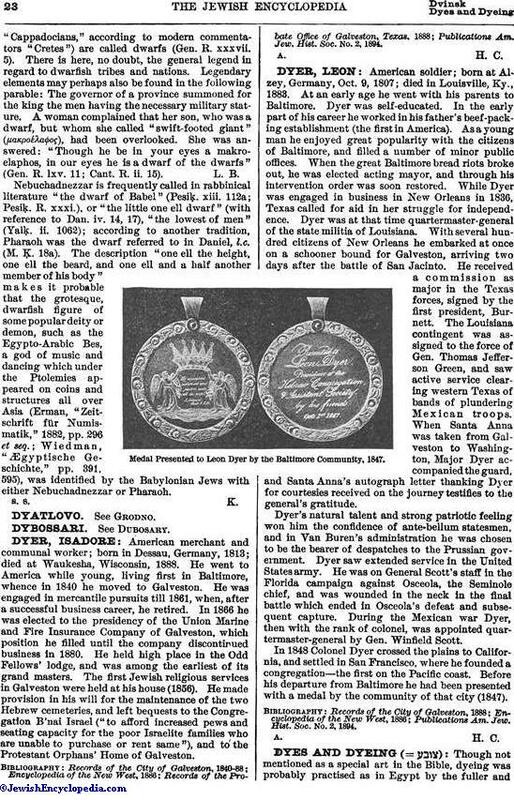 The description "one ell the height, one ell the beard, and one ell and a half another member of his body" makes it probable that the grotesque, dwarfish figure of some popular deity or demon, such as the Egypto-Arabic Bes, a god of music and dancing which under the Ptolemies appeared on coins and structures all over Asia (Erman, "Zeitschrift fur Numismatik," 1882, pp. 296 et seq. ; Wiedman, "Ægyptische Geschichte," pp. 391, 595), was identified by the Babylonian Jews with either Nebuchadnezzar or Pharaoh.